We are so lucky to be surrounded by so much natural nature and wildlife. Especially on our Mangrove Nature Tour, where the wildlife can sometimes start at tour office! Just this morning we saw the Scarlet Macaws in the tree above our office, and 3 Fiery Billed Aracaris. As we start off towards Matapalo, our tour takes up a kind of Safari-like feel because we usually see all sorts of wildlife on our drive there. Pretty much every day we stop to see the Three Toed and Two Toed sloths. Right now, the Three Toed has a baby! We are also spotting something so incredible…. a Common Potoo! This is the birdwatchers dream. She has been there for about 3 weeks now and we are hoping she stays a little longer for us. As we paddle through the Mangrove estuaries, we can see all sorts of birds, including falcons, hawks, ospreys, herons, kingfishers, shore birds, and so many more. We also have the chance to see the White Face Capuchin, Raccoons, Anteaters, Snakes, Lizards, Caiman, Turtles, Frogs and more. 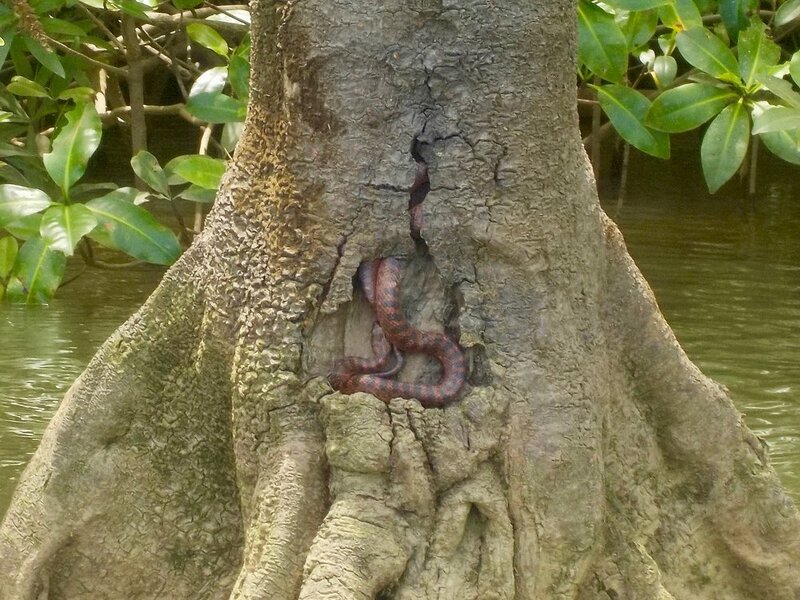 A few weeks ago, we were lucky enough to spot this guy in the photo: a Mangrove Cat Eyed Snake. Obviously nature is not controlled so we can guarantee all of these creatures on one tour, but you will definitely see a lot of them! Come explore the magical Mangroves with us soon!